LRS Manager Analytics Dashboard - The admin dashboard includes general analytics and visualizations that work with most out-of-the-box xAPI statements. See how your learners interact with assigned content, view your most popular content, identify potential issues, and identify learners that require help before they fall behind - all with visualizations from the admin dashboard. Don’t have a visualization that you need? We are fully conformant with xAPI, so use the services to create your own! Data Management - Already understand xAPI, but need detailed information and configuration options? Veracity Learning includes data management features like xAPI statement viewers and system logs. In addition, manage your data like a pro with import and export functionality. This includes services for backing up and restoring your system, harvesting data from remote LRSs, and exporting xAPI statements. Learner Portal - Rolled up data is nice, but what about my learners? Among the many super powers of an LRS is the ability to slice and dice data as it is needed. With Veracity Learning, individual learners can login to the learner portal to view their (and ONLY their) data. Learners can see their progress in assigned courses as well as other generalized visualizations. Motivate your learners by giving them the data they need! Cool Alpha Stuff ;-) - At Veracity, we’re always building new features that you request. As a result, we began the creation of class and course management features. Currently, these features provide classroom and course association capabilities that enable useful aggregations of stats. For example, did you ever want to know the percentage of your Tuesday evening class that completed all of the assigned courses, real time? Well, now you can do this, and more. 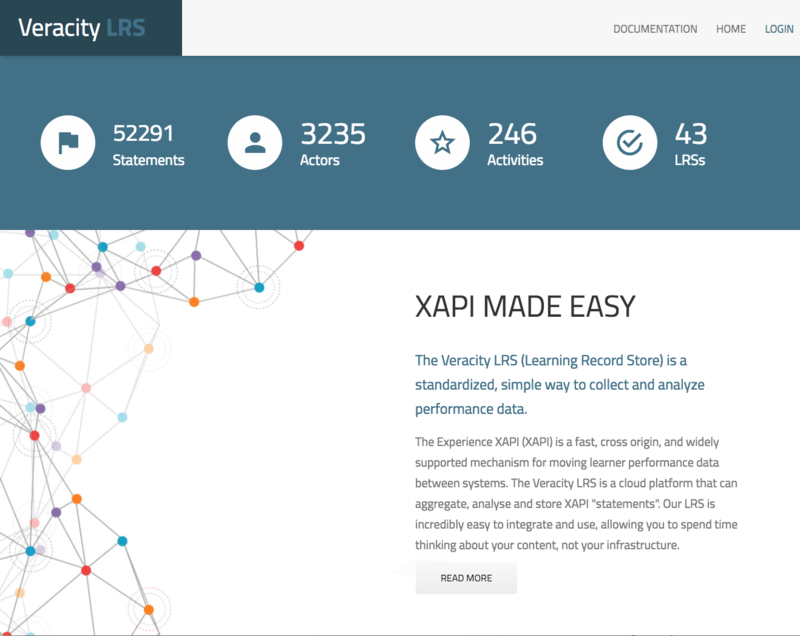 Launch it -> - Veracity Learning supports xAPI launch so content launched from the platform does not need to include hard-coded credentials or other sensitive information. Get serious about data and privacy by using Veracity Learning launch. Get Started! - Try the system out by signing up for an account and viewing our documentation. Don’t be shy - Reach out for support by filling out the form at the bottom of the home page if you need assistance, have any issues, or would like to recommend features. Thanks and enjoy! We look forward to hearing about your experience.